Jason Willome's art is a search for "the place where things start to break down and contradictions emerge." One of the fascinating results of his investigations, Matching Concealed Patterns (The Seam Grows When You're Not Looking), appears on the cover of Agave Magazine Vol. 3, Issue 2. This week we speak with Jason about transience, diegesis, and what can be found on middle ground. You've created sculptures and sketches but predominantly, you paint. Why? What motivated you to play with flat and three-dimensional spaces in works like Matching Concealed Patterns (The Seam Grows When You're Not Looking)? Those works were a way of distilling these ideas down into a more precise presentation. Previously, I had made a set of paintings from stills from the Frank Capra movie, It's A Wonderful Life--specifically from this moment in the film where the filmmakers double-exposed the scene with footage of snow falling. I suppose there wasn't enough snow in the original take, but it was always jarring to me to see what basically amounted to these two independent spaces sharing a moment in the time of the film. They work together enough that you can ignore it, and proceed with the narrative, but they also present a moment of revelation in a way, where the artifice of the film becomes visible, and the screen was suddenly there, where previously there had only been space. It was a moment that ever-so-slightly broke with the diegetic space of the film--and this reminded me of the gold leaf you frequently see in Catholic altarpieces: the gold leaf is on the surface, and asserts its difference from the narrative of the illusory space, providing emphasis for the viewer, while simultaneously playing a role in the space of the painting. So I made these snow paintings where the areas of the image that were occupied by snow were built up with this relief of paint material that both asserted the surface, and paradoxically played a role in the image, as an analogue of that moment in the film. The painting you referenced was a way of taking a more focused look at that idea. The atmosphere of objects around the figures in those paintings oscillate between diegetic and non-diegetic, functioning in the space of the image, casting shadows into the illusion, but also asserting the surface for the viewer and calling attention to the illusion. To use another movie as an example, it's like that moment in Say Anything, where the film music begins to warp, and John Cusack's character fixes it by shoving a matchbook into his car's cassette deck. The music reveals the artifice of the film, but also brings the viewer into a deeper involvement with the narrative illusion. The atmosphere of objects around the figures in those paintings are attempting something similar. What themes are you currently working on, and how are they taking shape? Right now, I'm trying to use these ideas as a way of framing and adding emphasis to other issues. I'm moving further off of the surface, and thinking more about how to emphasize the space between the image and the object. I'm using more temporal materials like salt and ice, which have their own time and phenomenology, and pairing them with images to emphasize an idea. For example, I have a set of works that appropriate images of the ignition contrails from the old Gemini and Apollo missions, where I have grown salt crystals in the areas of the contrails. It's that Carl Sagan idea of space exploration as self-investigation--we are all made of stardust. What role does transience play in your work? Lately, using these more obviously temporal materials is a way of juxtaposing different layers of time. There is the time of the image or the painted image, and then there is the time of the material. The salt contrails, for example, are framed behind glass, which slows the decay of the crystal forms, but allows in enough moisture that they continue to grow. This occurs in contrast to the rest of the static image, but also reflects the time intrinsic to the experience of the viewer. Every time I look at them they are different. It's somewhere in between Dubuffet's notion that his paintings were alive, and having an ant farm. ​Having explored the nature of experience and reality in much of your work, where do you believe truth in art lies? In the middle! Somewhere in between, where the mental and physical rub together. In spite of a photographic experience being a limited one, there is still something there that cannot be discounted, and which would not be available if the situation were otherwise. Images tell us something about the limits of our perception--how we build whole, complex models of the universe based on the little information we understand or have access to. I think that artworks give us a model or analogue to hold onto--art serves as an access point or an interface to an idea about the world. There's truth in that relationship--in the friction between acknowledging these two facets of experience. Margaret Morrison traces her love of painting back to a childhood of visiting museums with her family--decades later, she still has vivid memories of standing in front of a Dutch still life and vowing to learn the techniques behind bringing drops of water and luminous reflections to life on canvas. A professor at the University of Georgia, Margaret continues to keep her art and her family life happily intertwined: she and her husband, a fellow UGA professor, teach chemistry through art in a course that they developed together. Agave Magazine is proud to feature her painting, Both Ways: Drive Home in Vol. 3, Issue 2, and thrilled to speak to this overwhelmingly talented artist about her still-lifes, her departures from them, and her incredibly fulfilling artistic journey. AGAVE MAGAZINE: Your recent works are meditations on the zenlike aspects of driving and that point just beyond the horizon. How much time do you spend in your car, and what ideas do you tend to contemplate while you're behind the wheel? MARGARET MORRISON: These little meditative paintings were a departure for me, a returning homeward, literally and figuratively. My parents had always been the center of the family solar system, with a gravitational pull so strong that my sisters and I orbited around them. As my parents reached their nineties, their health declined rapidly. It's funny, but we all thought they were immortal. My father passed away in 2013 after a brief illness and not long after, my mother’s health began to fail and she passed away the following year. During those two years, I made the cross-country drive a number of times from Georgia to Utah. I felt compelled to say goodbye to my parents and to spend whatever time they had left with them. Over hundreds of miles, I had the time to meditate and reflect, to rehearse all my memories. I suppose you could call it a melancholy life review. As I traveled, I found a profoundly rich, yet bittersweet closure. Your series have examined everything from the glistening comfort of sweets to child's play that reflects an adult world to your extensive travels as a child. Have you already had any thoughts about the next theme you'd like to investigate in your work? Painting realistic reflective and transparent surfaces is a major analytical challenge, and one that you seem to take on with aplomb. What do you enjoy about this aspect of your work? Oh my goodness, I LOVE painting bling! It’s the greatest logic puzzle I can possibly imagine and I’m absolutely addicted to it. And yes, it is very much an analytical challenge, but so very satisfying when I get my head wrapped around it. I love it when people ask me how in the world I paint glass. “Is there a particular kind of paint you use?” The answer is no, there is no tube of paint out there that says “glass” on it. I explain that I don’t paint the glass, I paint the distortions that I see through the glass and then it materializes on its own… like magic. As I’m working, I’m completely absorbed in creating a lush, juicy surface using plenty of wet oil paint. I work with a sense of immediacy so that I can lay down a particular field of color and then start pumping more paint right onto of the surface of the painting. I’d say that most of the color mixing in my paintings happens on the canvas rather than the palette. I work from general to specific, dark up to light. I think of the highlights as the frosting on the cake. How long does it take you to complete a painting? Truth be told, I’m actually a pretty fast painter. I’ve got a lot of pent-up energy and I throw the paint down as quickly as I can before my ideas evaporate. Nothing shuts me down faster than a pristine, white canvas, so I cover the entire canvas with paint right away. It helps me to see if the piece is holding together from the start and establishes a visual language that I can hang the rest of the painting on. For me, starting a painting is much more challenging than finishing a painting. Often I’ll juggle several paintings simultaneously in various stages of completion because, once my ideas are fleshed out, I can set them aside and come back to them later with renewed energy. I’ve found that if I’m working on one painting at a time, I run the risk of getting bored or overworking it. I also prefer to paint while standing up because it allows me the freedom to pace around and to step back to check the “gestalt.” I probably log a few miles a day just pacing up and back as I paint. 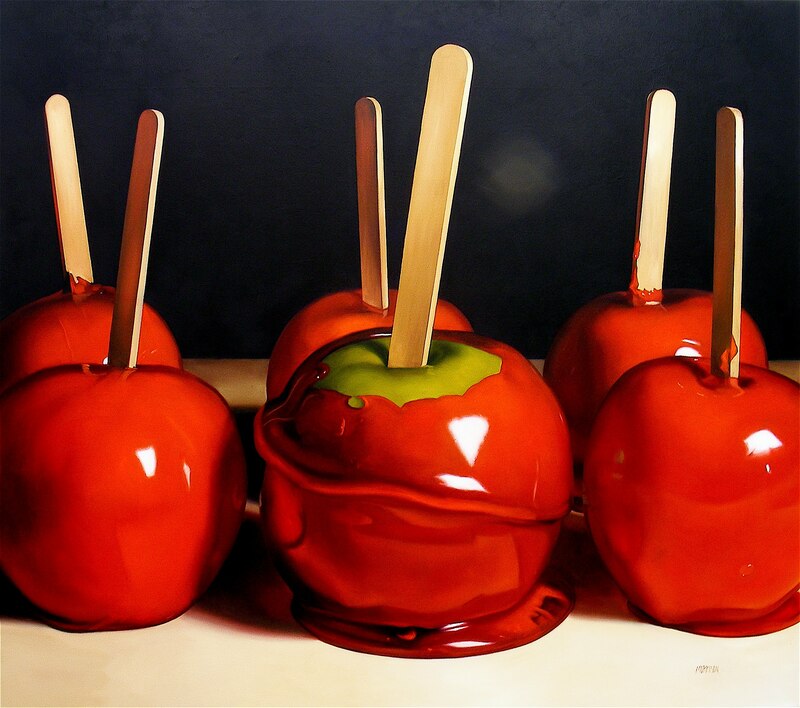 One painting that I remember coming together faster than any other was Candy Apples. At the time, I had been working hard on a body of paintings for my Larger Than Life exhibition at the Woodward Gallery in NYC. The week before shipping my paintings to the gallery, I decided that I just HAD to paint ONE more for the show. I had so much built up angst that I started and finished that massive painting in three days. What has been the most valuable thing you've discovered through your art so far? This whole journey of mine has one of deep satisfaction and joy. I’ve seen all my dreams as an artist and a mother come to fruition. Years ago, as a newly married couple, Richard and I flew to Chicago to see a John Singer Sargent exhibition. One early evening, while strolling through the campus at Northwestern, we chatted about our respective “bucket lists.” We both dared to dream of being old college professors teaching at the same university and laughing at the improbability of it. As we walked, I clearly remember seeing a row of glass front galleries on the next street over. And as the sun went down, and the lights came up, I could see an art opening going on in one of them. People were crowded into that little space with glasses in their hands, deep in conversation with track lights sparkling. I remember a twinge of longing, wondering if someday I might have a opening just like this, filled with people who had come to see my paintings on the wall. Now in hindsight, what I thought was unimaginable all those years ago has come to pass for me. Not only have I seen my dreams become reality, but I’ve been able to include and share them with my husband and children. As a mother, the first time I held a newborn in my arms, I experienced the ultimate expression of the sublime. My work has become my vehicle for channeling and expressing this sublimity. Robin Boyd: "Metaphor is the only way I know how to begin to get at the ineffable truths." Agave Magazine contributor Robin Boyd's poem The Siberian Flamingo represents a departure from the flora and fauna of New Hampshire that often appear in her works, but nevertheless fits seamlessly into her passion for exploring how human beings interact with and find meaning in their surroundings. Here we talk to Robin about the beauty of liminal spaces and her role in illuminating them. AGAVE MAGAZINE: You have degrees in environmental education and creative writing. Which came first, and why did you then pursue the second? ROBIN BOYD: My creative writing degree came first some 40 years ago. My environmental ed degree came 15 years later. I attended a field school, the Audubon Expedition Institute, where a learning community of 20 or so people--some students, some teachers--traveled North America for three semesters on a modified school bus studying environmental issues like logging, fishing, mining and farming to understand how these activities impact the environment and find ways to effect change through listening, leadership, problem-solving and finding consensus. It was the hardest thing I ever did and the most rewarding. It changed how I understand the world and how I live in it. You say that your work "explores the edges where human and nonhuman worlds make contact and inform each other." What can we learn from these liminal spaces? Edges are where the action is. It's where the I and thou come together in rich profusion. I think of the littoral zone, the place where ocean meets land, and where fish and fowl and mammal all come together to reproduce, interact and nourish each other. For the human and nonhuman worlds, the edge is where we meet and recognize our connections--where we observe, adapt and live in proximity to the other. The edge is where my cat met the coyote and it's where I come to understand that, ultimately, there is no I and thou, only a continuum of relationship. My favorite working poet is Jane Hirshfield. She's a gifted observer who discovers poetry in the most homely of subjects. I admire the layers of meaning she delivers in few words, an elegant spareness that reflects a lifetime of Buddhist meditation and study. And then, I would say Rilke is my other favorite poet. His poems are mystical yet reveal an uncanny insight into the quantum universe. The Siberian Flamingo has a more conversational tone than many of your other poems. Why did you use this particular technique? I wrote The Siberian Flamingo as a parable for a friend, which is why the language is more conversational than lyrical. My friend was diagnosed with cancer for the second time in her life--the first time forty years ago and then again two years ago. It occurred to me to tell her the story of the Siberian flamingos as a way to remind her (and me) that miraculous things can happen once and sometimes twice in the same place. What impact do you hope your poetry will have? Writing is the only thing I know how to do. I'm not handy, or crafty. I'm not particularly social. So when I think about how I can have an impact on what matters--I hope that my poems can help to awaken others to the beauty and vitality of the delicate processes that sustain everything.